Bold flavor, color, fun! That’s how I think of Sushi-Rama. 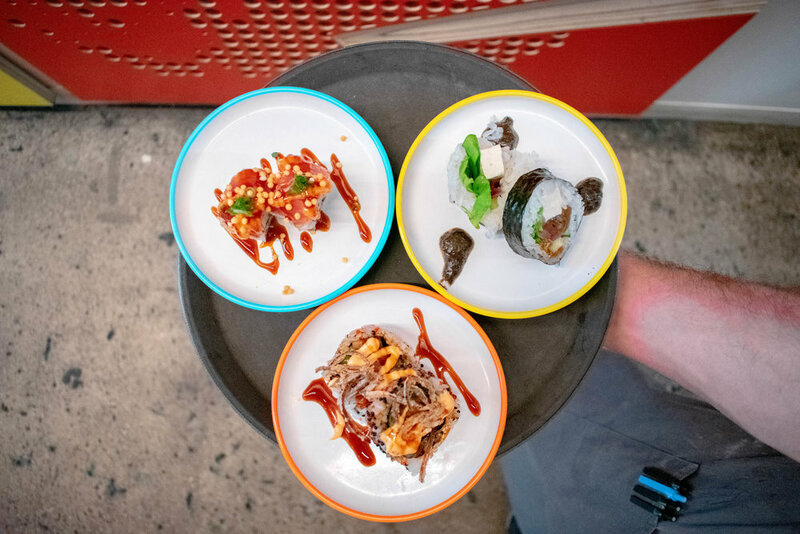 Color splashes from every inch of the room, including the plates that signify the price point of each roll that streams along the conveyor belt. Catch a few new rolls on the menu including the Pineapple Express (last image), Surf & Turf, Red Widow (fourth image), The Kraken, & the Umami Roll. If the idea of stacking plates to an absurd height doesn’t do it for you, check out the kitchen menu. There’s some new & classic dishes on there you’re not going to want to miss out on. Furikake Fries, House Salad, Tempura Udon (fifth image), Kara’age Chicken, Rama Bowl (third image). While my meal was compensated, the opinions and views expressed on Julie Likes Food are my own.